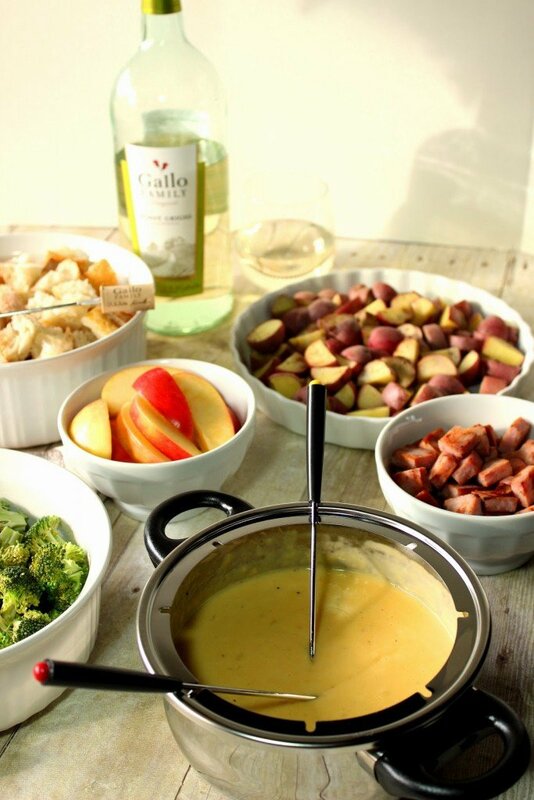 This Classic Swiss Fondue is rich, creamy and super cheesy with just the right amount of Gallo Family Vineyard’s Pinot Grigio along with a splash of nutty Amaretto to keep things extra flavorful. Perfect for using with all kind of dippers. It’s as warm as a comforting hug on a cold winter’s night. Giving comfort to those in need is a wonderful thing and should not be holiday exclusive. It should be something we all think about and do on a regular basis. However, as we all know, life gets busy, and we tend sometimes to forget that there are others in this world who need help from time to time. Whether it’s a warm meal, a comforting hug or a hand up to those who are down on their luck. This month, with the help of Gallo Family Vineyards, the #SundaySupper team has come up with a few special ways we can all give a little comfort where comfort is needed and is also some much needed nourishment for the soul. Speaking of nourishment for the soul, sometimes a little wine can do just that. 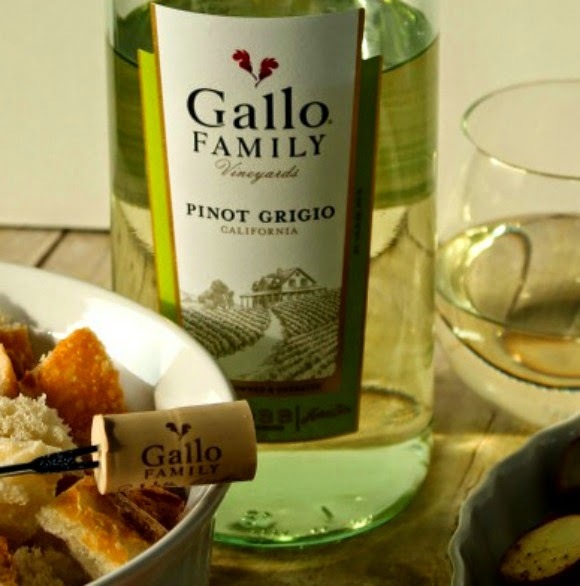 So why not reach for Gallo Family Vineyards‘ delicious light and slightly fruity Pinot Grigio (shown above), or Gallo Family Vineyards’ rich, mellow and full bodied Cabernet Sauvignon. 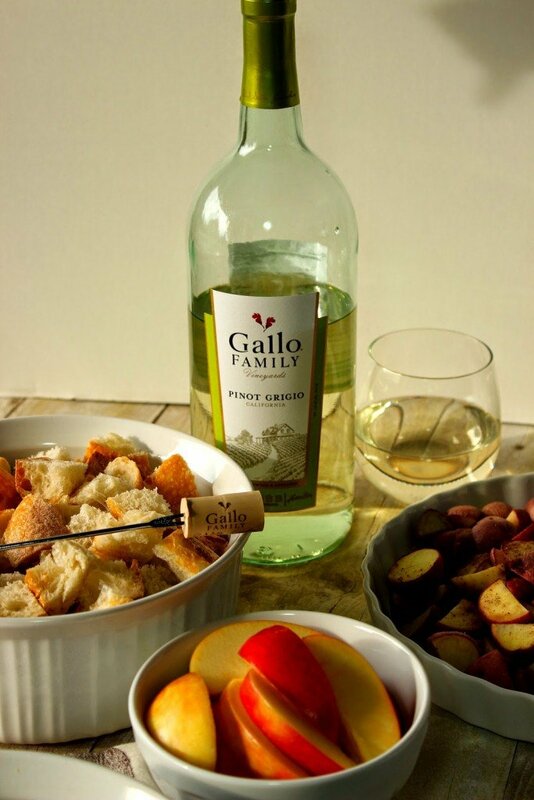 Whether you’re adding Gallo Family Vineyard wine into your favorite comfort food recipe, or will be serving a glass along with it, Gallo Family Vineyard wines are what I reach for time and again. 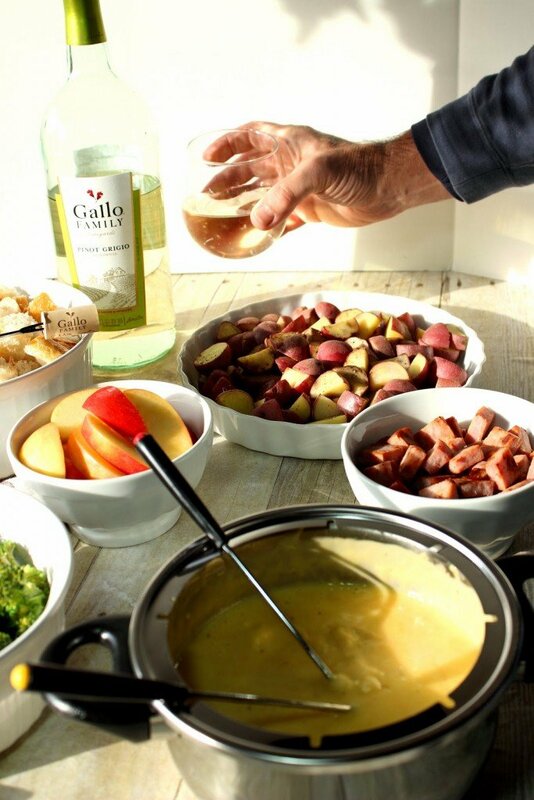 I’m super excited to be pairing this recipe for Classic Swiss Fondue along with Gallo Family Vineyards and their Every Cork Counts campaign. From now until December 31, 2014, Gallo Family Vineyards is helping feed families by donating $1 to the Meals On Wheels Association of America for every wine cork you send them (up to $50,000). -In a medium saucepan over medium heat, saute the shallot in the butter until softened. -Add the Gallo Family Pinot Grigio and bring to a simmer. -Stir in shredded cheeses and stir until melted and creamy. -Stir in the apple cider vinegar, black pepper, nutmeg and amaretto. 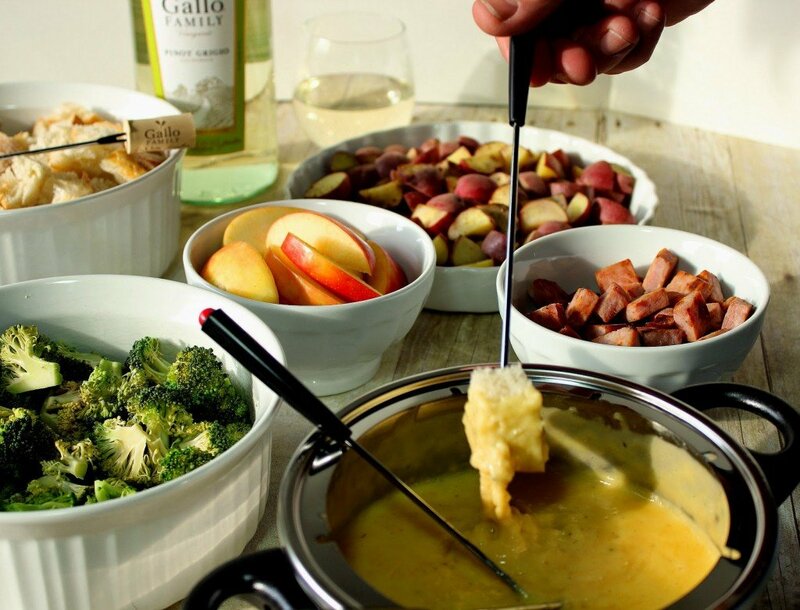 -Transfer the fondue to a fondue pot and serve with your choice of dippers. Please note: Compensation for this post was provided by Gallo Family Vineyards via Sunday Supper, LLC. The opinions expressed herein are completely my own and are not indicative of the opinions or positions of Gallo Family Vineyards. And, as always, please remember to drink responsibly! To find where to purchase Gallo Family wines in your area, click here. For a dollar off digital coupon on your next purchase of your favorite Gallo Family Vineyard wine, click here. For further information about Gallo Family Vineyards, I urge you to follow them on Twitter, Facebook, Instagram and YouTube. You would find me totally parked by the table and blocking everyone from getting to this because I would want every bit of it for myself. Fondue always reminds me of my parents' dinner parties in the 70's! Yours looks perfect…and I'm certain the Gallo Pinot Grigio adds an incredible flavor!!! Fondue, wine, and friends? That is the perfect comforting DAY! There are so many delicious things happening here. 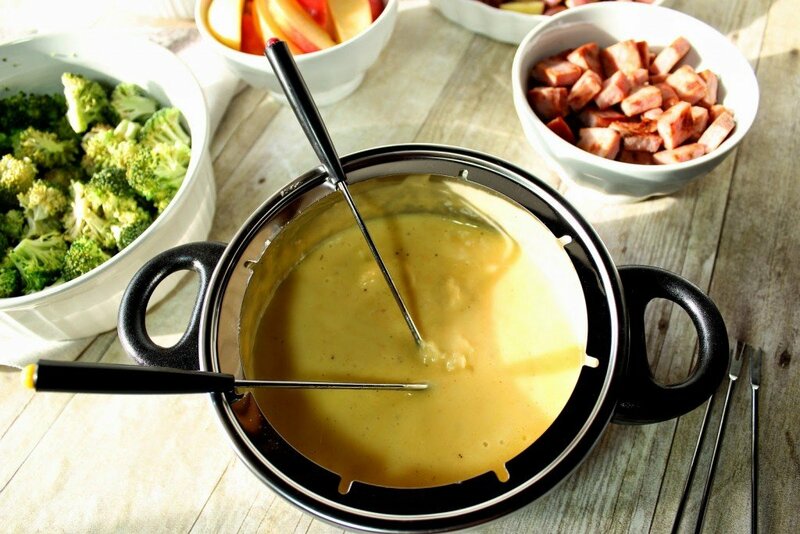 Love that you used Swiss cheese in this fondue. I think I need to come to your house. 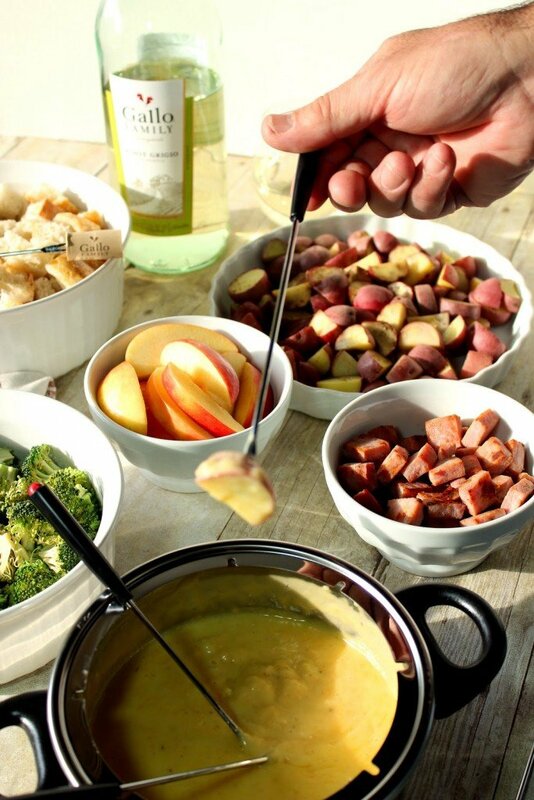 Your fondue looks incredible and so much fun! This is a fabulous recipe, my kids would love this never mind my friends with a glass of wine in hand! Thanks for the inspiration! of creamy, melty cheese to dip ALL the things in!? Fondue is so much fun! I love making it and all gathering around to enjoy it. I bet the wine really elevates the flavor too!! I haven't made fondue in a long time. Great idea! I want to go on record that you may skip the fork…I am going to grab a spoon and dig in!!! I adore fondue, and I often use all of the dippers you do, plus small whole raw button mushrooms. YUM! I hope that cork didn't end up in that luxurious pot of cheese 🙂 Fondue is the best and I am sure the Pinot Grigio makes it wonderful! Who doesn't love fondue?? So much to dunk! Oohhh fondue!! That warm cheesy goodness looks sooooo good!